On the set of FNF4. One of Paul Walkers character cars is a Kaizo R34 GT-R. The R35 GT-R is probably going to be provided by JSpec Connect, probably. Thanks goes to reader cece, who linked to pictures of Vin Diesel and Paul Walker on the set of “The Fast and the Furious 4″ in one of the comments section. In the pics, it looks like Diesel is chilling and enjoying the sights (especially the one in the hot red dress — wow), while Paul Walker may be shooting a scene. Or not. 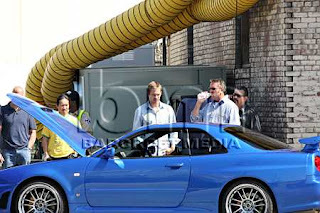 In any case, since “The Fast and Furious 4″ seems to be a popular topic on the site, here are more pictures from the set. I am sitting here laughing out loud. Thats not Vin Diesel. More pictures from the set.